It’s been said that age is just a number. Some of us feel like we are old souls trapped in young bodies while others find their old age irrelevant to their youthful spirits. If there’s one person who knows this, it’s photographer Zachary Scott. 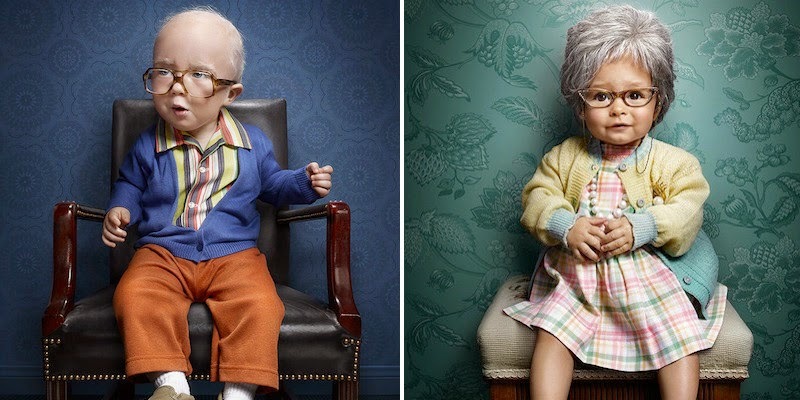 For his latest project, this California-based artist captured a series of images showcasing six “old babies.” In each portrait, the child is turned into an elderly person, occupying roles that cover everything from seasoned businessmen to adorable grandmothers. The series was born because of a New York Times article highlighting the work of Ellen Langer, a Havard psychologist who has spent a great deal of her career studying the effects that a youthful mindset can have on warding off the aging process. The Times commissioned Scott to take the photos to accompany the article. Ultimately, the series is a testament to the seriousness of play, illuminating the vitality and whimsy that lies within us all, should we choose to tap into it. Take a look at the photos below to see the hilarious old babies. This little old lady is dressed in her Sunday best.